Universities throughout North America are engaged in discussions about integrating meaningful, skills-based student development into post-secondary curricula. Wilfrid Laurier University has stepped up to the challenge, continuing to build on the existing suite of experiential learning and career development opportunities available to students. While skills development may bring to mind activities outside the classroom, the newly developed Career-Integrated Learning (CIL) program actively engages students in skills-based learning inside the classroom. In collaboration with faculty partners, staff from Laurier's Career Centre present information about the competencies that are valuable to employers and discuss how students are developing these through their coursework. At the end of the course, students are asked to draft a reflective statement, as they might for a cover letter or in response to an interview question, outlining the skills they have developed. "A university education goes beyond job training and should be based in the exploration of ideas...we owe it to our students to help them recognize the range of valuable competencies they develop during their degree so they can feel confident in their career search." The concept for this program originated from Memorial University. Their research found that students benefited from CIL in a variety of ways including increased appreciation for the course content, active engagement in skill development, and an improved ability to articulate those skills in pursuit of future educational and career goals. Ada Sharpe, assistant professor in Laurier's Department of English, sees CIL as an effective way to inspire students to recognize and articulate the value of their university studies, and as a result, help them to nurture a sense of purpose throughout their academic experience. "A university education goes beyond job training and should be based in the exploration of ideas," says Sharpe. "But we owe it to our students to help them recognize the range of valuable competencies they develop during their degree so they can feel confident in their career search." Beginning with a pilot in spring 2017, Sharpe has included CIL in four sections of her course EN190: Introduction to Academic Writing. 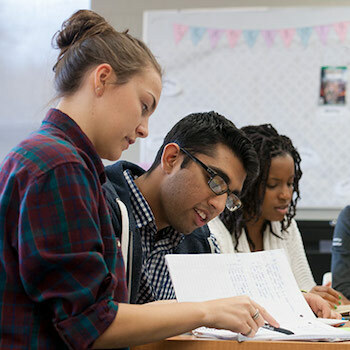 Students in EN190 gain foundational skills in writing and communication applicable across all areas of study, including the ability to summarize complex ideas, critically review source material, present ideas verbally with clarity and purpose, and engage in the civil and open exchange of ideas. Sharpe believes there is significant value in adding CIL components into these foundational first-year courses, especially because it is the first university-level writing course for many students in EN190, who come from a variety of departments. As a part of the CIL program, students in Sharpe's class receive time to reflect on the skills and career competencies developed through course content, assignments, and lectures. For many students, this reflection goes beyond the coursework. "In first year, many of us do not know exactly what career we are looking for," says Sarah Caley, a first-year student in the Faculty of Arts. "CIL provided resources and helpful information to encourage us to keep our minds open to different career paths." Caley is interested in pursuing a writing career after graduation, but she understands how transferable writing skills can be in a number of professional environments. "Writing is a crucial skill in most workplaces," says Caley. "The CIL activities really helped me make the connection between my coursework and my future." Integrating self-reflection and employment-focused course elements has equal benefits for senior students, says Jenna Hazzard, a fourth-year Medieval Studies and English student. She was introduced to CIL in ML402: Teaching, Learning and Thinking Through Medieval Studies, a fourth-year seminar course and teaching practicum taught by Alicia McKenzie. "I have family and friends who still ask me about the practicality of a degree in Medieval Studies," says Hazzard. "The CIL experience gave my peers and me concrete language to better explain how what we've learned in our courses can actually benefit us in our future careers." For many faculty members, CIL offers a convenient system for developing and sharing this vocabulary with students using assessments already embedded in their courses. McKenzie notes that while there is significant emphasis placed on developing course-level learning outcomes, assignment-based learning outcomes are less common. CIL gives students the chance to understand the purpose of an assignment and how it relates to their personal and professional development. "I have always built space within my assignments for students to reflect on their successes and challenges," says McKenzie. "Introducing CIL into my classroom took this one step further, encouraging students to develop a better understanding of the valuable skills they develop in the process of mastering course material." CIL has been implemented in 35 classes, reaching more than 1,700 students across Laurier's campuses since May 2017. The competency framework used for CIL is a benchmark for all experiential learning activities at Laurier. Student competencies developed through experiential learning include: functional knowledge; communication; collaboration and teamwork; critical thinking; problem solving; adaptability and resiliency; leadership; creativity and innovation; diversity and intercultural understanding; technological ability; self-awareness and professional attributes. For more information about the Career-Integrated Learning program and other experiential learning opportunities contact Jan Basso, associate vice-president of Experiential Learning and Career Development at Laurier.